Statuesque and photogenic, with a megawatt smile, Tori Anderson makes the perfect subject for a splashy poolside Watch! photo shoot. In these gorgeous web-exclusive photos, the blonde bombshell and star of The CW’s No Tomorrow, embodies living in the moment. In the series, Tori’s risk-averse and regimented character Evie Covington has traded caution for a more carefree life with the help of a free-spirited new friend. Get to know Tori in these fun interview nuggets and check out this lively behind-the-scenes video. 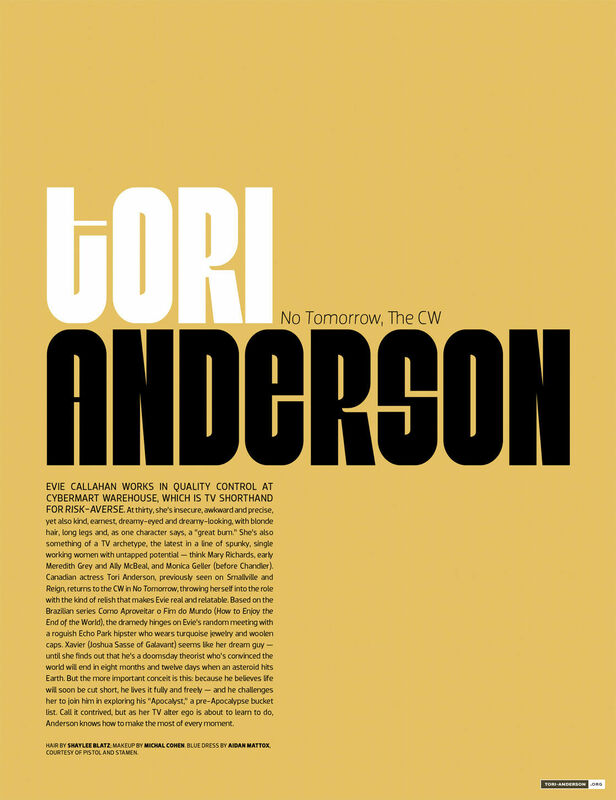 Tori Anderson was born in Edmonton, Alberta and raised on Vancouver Island, British Columbia. The second youngest from a family of five children, Tori and her siblings grew up immersed in the arts and tasked with endless farm chores. Tori Anderson got her acting start in her home country of Canada. At 15, she landed her first professional gig in a pilot episode of the sci-fi drama series Tru Calling. 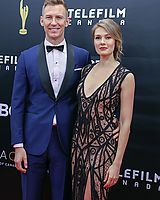 After high school, she moved to Toronto to pursue acting and received a BFA from York University’s Acting Conservatory. Her recent television credits include a recurring role as Sabine on Killjoys and a lead role on The Other Kingdom. On the big screen, Tori Anderson has appeared in the films Killing Daddy, The Mermaid Chair, To Have and to Hold and Cable Beach. 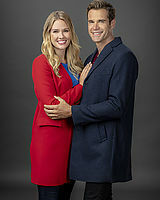 Tori Anderson and co-star Joshua Sasse went out to dinner a few times before shooting No Tomorrow just to get to know each other and help spark good onscreen chemistry. Tori Anderson is the perfect girl-next-door. Her effortless charm and genuine niceness is just one of the reasons this Edmonton-born actress is destined to be Canada’s next sweetheart. 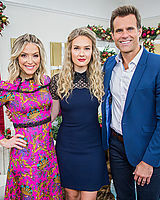 She’s currently starring alongside the dangerously handsome Joshua Sasse in CW’s No Tomorrow which picked up a nomination for the People’s Choice Award for Favourite New TV Drama. I’m a bit of a chameleon – grunge, bohemian and loose. Where do you think you got your sense of style? What influences you? Music, muses and movies. Every era entices me in some way or another. Which designers dominate your wardrobe? Free People, Rag & Bone, band t-shirts, vintage finds, and plaid shirts from my dad’s closet. Diverse – anything you want it to be. What’s your favourite item in your wardrobe and what’s the story behind it? Where did you find it? How much did it cost? Why is it your favourite? This vintage vest from the 70’s that was in my Mom’s costume room. It is black suede and embroidered with vines and flowers. Just looking at it makes my heart happy. One of the best parts about it was also that it happened to be free. What are your top three beauty/grooming products you love right now? • IT Bye Bye Redness Correcting Cream – It is AH-MAZING! I use it as a concealer. • Oi Oil Davines – Everything I wished Moroccanoil would be. • Ouidad Deep Treatment – Restores my hair after every use. What top trends do you love for Fall? Velvet, Knee High Boots, Pantsuits and lace. Always lace. Favourite store/retailer in the world and why? The Bay and Nordstrom. The Bay has amazing sales and Nordstrom carries great lines. Both are almost a one stop shop. What is the best city in the world for shopping and what are the must-visit stores? Toronto. Shop the Ossington strip and you will find a huge range from high end retailers to vintage shops. Check out Queen Street West. Who (living or dead) would you want to have dinner with? Where would you take them? And what would you want to talk to them about? Katherine Hepburn. The house I grew up in for a home cooked meal. The state of women’s roles in the film and TV world and how we can continue to encourage change. You have a blank wall and need to find a piece of art to fill the space. What would you hang? Tom Thompson. His work is distinctly Canadian. My aunt Lynn Malin, the way she uses colours brightens up any room. I have obsessed over her work my whole life. Check out the official press release for the upcoming eighth episode of No Tomorrow. EVIE GETS CAUGHT IN THE MIDDLE -Xavier (Joshua Sasse) gets a job at Cybermart to spend more time with an overworked Evie (Tori Anderson), but ends up complicating her life when he rallies the warehouse employees into a strike. Meanwhile, Kareema (Sarayu Blue) decides to confront her feelings about her secret lover and makes a bold move. Amy Pietz, Jonathan Langdon and Jesse Rath also star. Jessica Chou wrote the episode, directed by Michael Schultz (#108). Okay so not great news, right? Hopefully The CW still gives us a chance. Stay positive, people! The CW announced unveiled its midseason schedule Wednesday, setting premiere dates for new drama “Riverdale” as well as returning series “Reign,” “The 100,” “The Originals” and “iZombie.” Not on the midseason schedule are freshman series “Frequency” and “No Tomorrow.” The CW is not giving a full-season order to either show. Their fates will be determined at a later date. The network also set a series finale for “The Vampire Diaries.” The drama will end its eight-season run on the CW March 10. “Riverdale” will debut Thursday, Jan. 26 at 9 p.m., following the return of “Supernatural” from its midseason hiatus. “Reign” will debut Friday, Feb. 10 at 9 p.m. After “The Vampire Diaries” ends, “The Originals” will premiere its new season Friday, March 17 at 8 p.m. 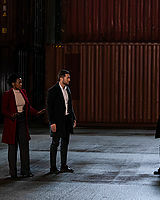 The “Legends of Tomorrow” season finale will air Tuesday, March 28. The following Tuesday, April 4, “iZombie” will debut its new season with back-to-back episodes. It will slide into its regular 9 p.m. time period following “The Flash” a week later. The “Crazy Ex-Girlfriend” season finale will air Feb. 3. The season finale of “No Tomorrow” will air Jan. 17, with the season finale of “Frequency” slated for Jan. 25. 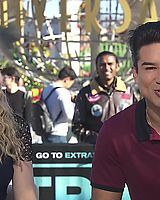 Both shows have a averaged a 0.3 live-plus-same day Nielsen rating among adults 18-49 this season, making them the network’s lowest-rated shows aside from “Crazy Ex-Girlfriend,” which airs Fridays. ‘No Tomorrow’ Nominated for People’s Choice Award! What a surprise! Looks like No Tomorrow has been nominated for Favorite New TV Drama for the People’s Choice Awards! How great is that? It’s pretty great. Be sure to click the image below to head on over and vote for the show! Click the image to vote now! I’ve added episodic stills from the upcoming episode of No Tomorrow into the gallery. I’ve added episodic stills of Tori from the fifth episode of No Tomorrow into the gallery. Can’t wait for Tuesday! 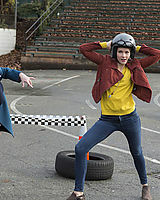 EVIE AND XAVIER TRY TO RIGHT OLD WRONGS – Evie (Tori Anderson) attempts to make amends with her former best friend Fern (guest star Allyn Rachel), while Xavier (Joshua Sasse) realizes he needs to tell Evie how he really feels about her. Amy Pietz, Jonathan Langdon, Jesse Rath and Sarayu Blue also star. Bill Krebs wrote the episode, directed by Ron Underwood. Tori was featured in the eighth issue of Emmy Magazine recently in their “Faces of Fall” section. You can check out the scans in the gallery by clicking the photos below!